A man accused of killing a teenage boy he thought was a witch cut the hair of a young woman to "release the witchcraft", the Old Bailey has heard. Naomi Ilonga, who was 19 at the time, said Eric Bikubi accused her of witchcraft, known as kindoki, because she bit her nails. 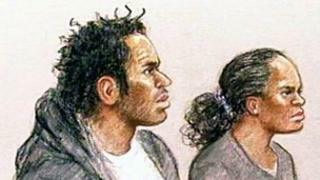 Mr Bikubi and his partner Magalie Bamu, both aged 28 and from Newham, both deny murdering her brother Kristy, 15. He drowned on Christmas Day 2010 during torture to produce exorcism. Miss Ilonga, 23, said she considered Ms Bamu to be her cousin but she had gone along with Mr Bikubi's accusations during her stay with the couple at their home in Dagenham, east London, in August 2008. "My hair was down the middle of my back. Eric cut it very short with scissors. He said it was to release my kindoki. I was very upset," she told the court. "Eric was asking 'why do I bite my nails?' It was just a habit. He goes to me, 'Have you got witchcraft, kindoki?' I told him I don't believe in kindoki." Miss Ilonga said she was weak after being made to fast for three days and deprived of sleep while the couple prayed over her. She added that Mr Bikubi said her money was tainted and threw it away before getting Ms Bamu to throw out the clothes and pots and pans she had touched. She said he accused her of disturbing the sleep of an infant by witchcraft. "We didn't sleep for three days, we had no food and water. Everyone fasted and were praying about the release of kindoki." She said she left after telephoning her mother to fetch her.